The Retrakt is machined from aluminum. The pen is a little over 142mm long and at the widest point below the knock about 12mm wide. KarasKustoms gives the weight at a little over 28 grams. The Retrakt on a Molekine Cahier pocket notebook. The center of gravity lies a litte above the point where the two sections meet. Depending on your grip the pen feels more or less top-heavy but never unwieldy. Size in general was a big surprise to me when I unpacked my Retrakt. 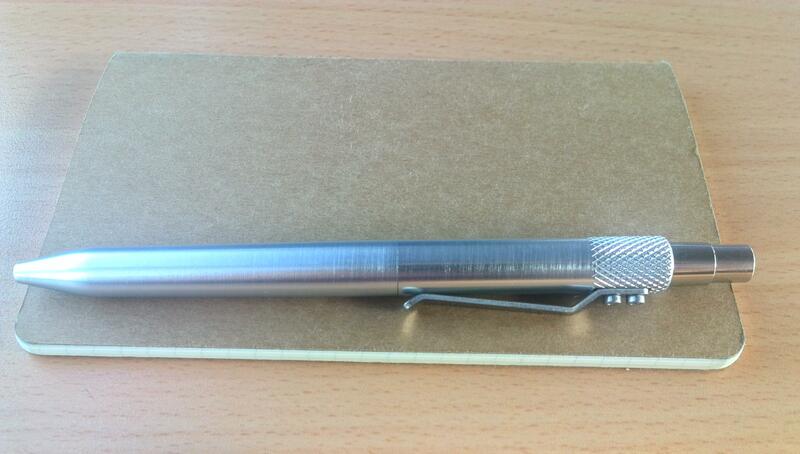 The pen looks massive, like a serious piece of equipment that was hand crafted in a machine shop should look. Compared to one of the Pilot G2 gel pens that donated the refill for the Retrakt, the pen looks chunky due to its solid aluminum construction. It’s longer than the Retro 51 Tornado (which is considered relatively short) but comparable in width at the widest point. It dwarfs the Parker Jotter that I am planning to replace with it in both length and width. The build quality is solid, all the parts fit together without any gaps or misalignment. 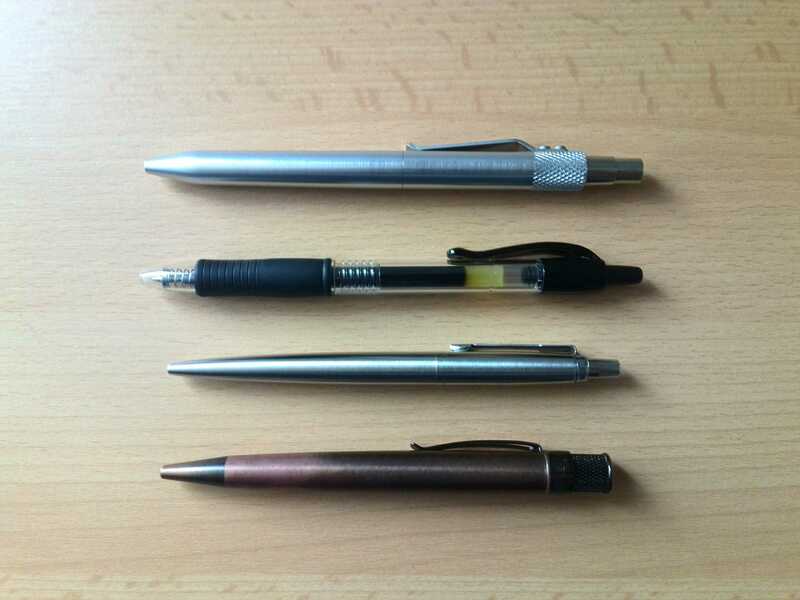 The refill is held firmly in place at the tip when deployed with no little to no wiggle or noise while writing. 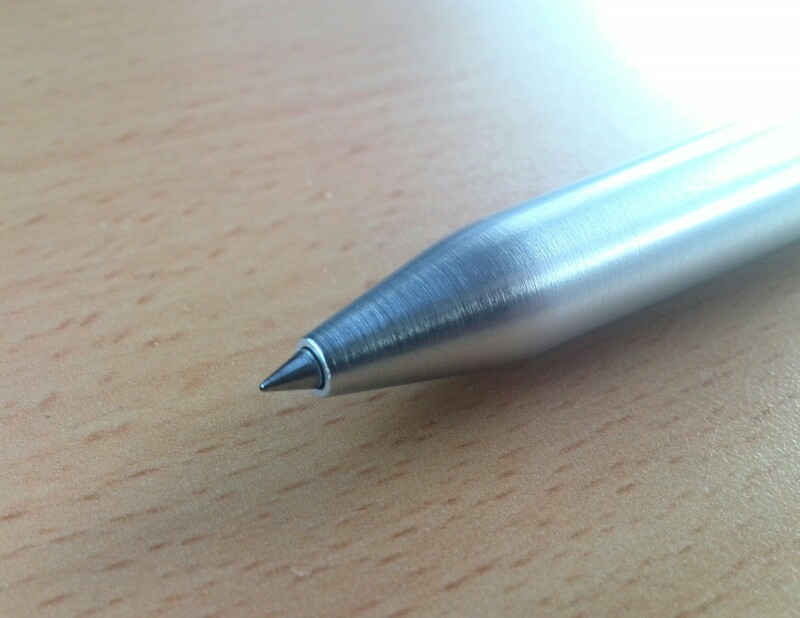 There is a tiny rattling sound in the knock mechanism when you violently shake the pen while the refill is not deployed, but to provoke that noise you have to shake the pen in a manner that is almost caroonish. Exploded view. The knock comes of, too. The mechanism itself is a surprise. 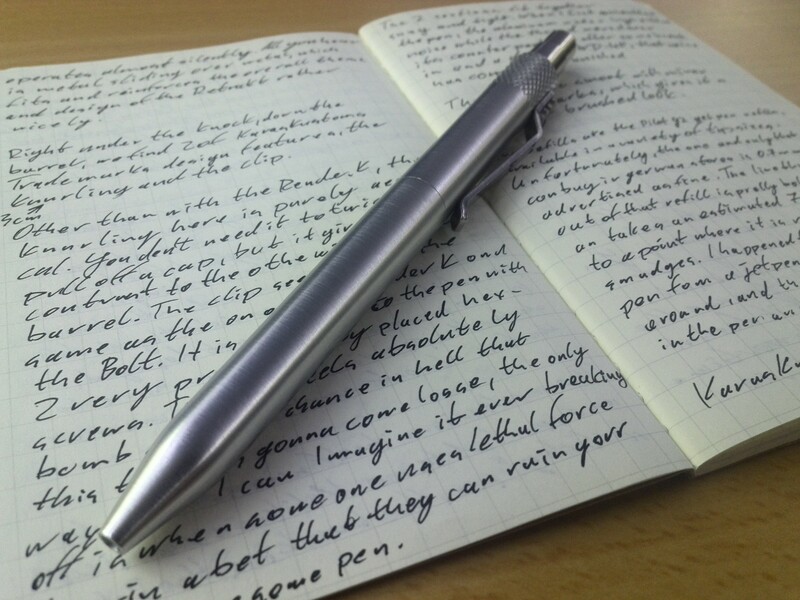 It is very different from a classical „clicky“-style pen. The knock on the Retrakt operates almost silently. All you hear is metal sliding aver metal, which fits and reinforces the overall theme and design nicely. I have to say that the knock is giving me some trouble sometimes. When you press and kinda miss it, you can feel the mechanism choke. Right under the knock, down the barrel, we find two of KarasKustoms design trademarks, the knurling and the clip. The knurling here is pure aesthetics. Unlike with the Render K, you don’t need it to twist or pull off a cap. It does give a nice contrast to the otherwise smooth barrel, though. The clip seems to be the same as on the Render K and the Bolt. 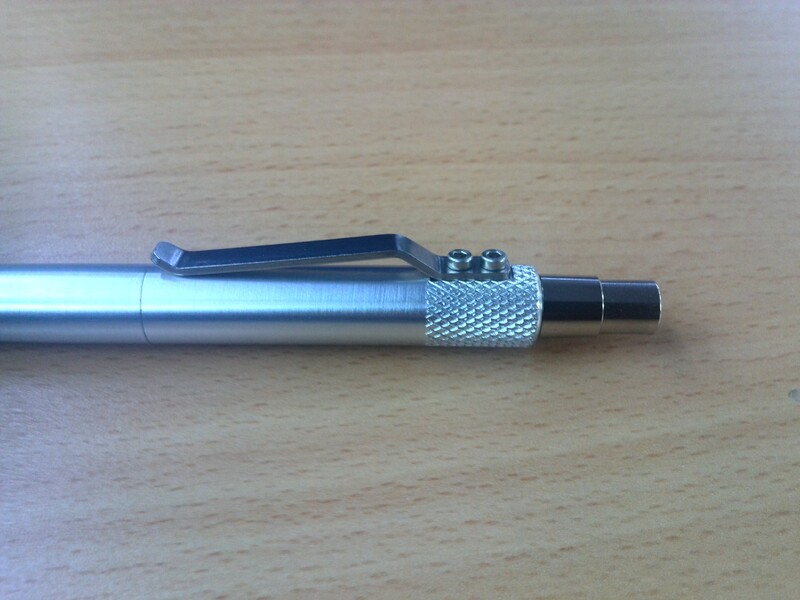 It is attached to the pen with two very prominent hex screws. The clip feels bomb proof, no chance in hell that this thing is gonna come loose. The only way that I can imagine it ever breaking off is when someone uses lethal force to deliberately ruin your shiny pen. The 2 sections fit together snug and tight. 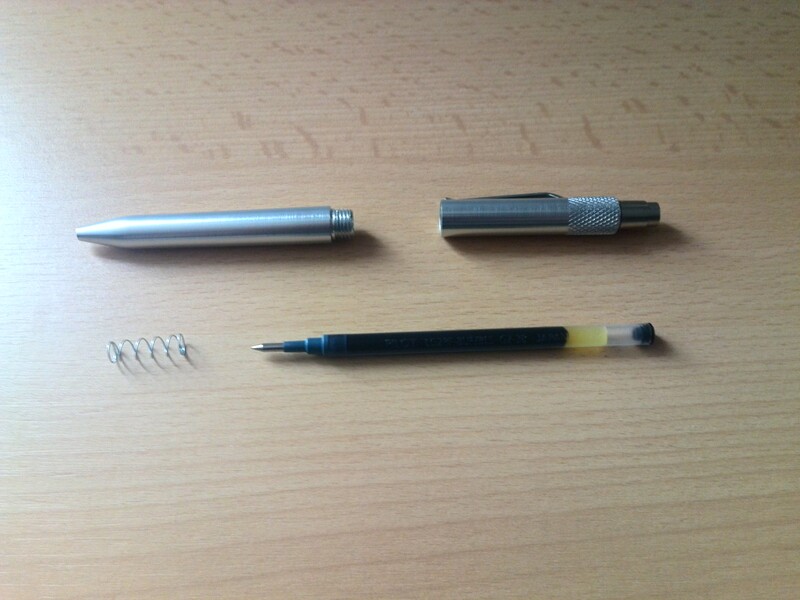 When I first assembled the pen the aluminum made a high pitched noise while the thread moved over its counterpart. After some break in and applying some WD40 that noise has completely vanished. The barrel is smooth with minor machine marks, which gives it a brushed look. The Pilot G2 0.38mm refill. The Retrakt uses the Pilot G2 gel pen refills, available in a variety of colors and tip sizes. The one and only size that you can buy in German stores (at leats the ones that I have access to) is 0.7mm, advertised as fine. The line that comes out of that refill is much too bold for my taste, an it takes about a week to dry to a point where it’s not leaving smudges. I happened to have a 0.38 Pilot G2 pen lying around from a jetpens.com order. That refill works very well on the page and in the pen. KarasKustoms is also packing all the parts that you need to use Parker style refills, like the Fisher space pen or the Schmidt Easyflow 9000. I never liked ballpoint refills, but for the sake of this review I tried the Easyflow 9000 with the Retrakt and it works very well. The pen is heavy, there is no way around it. Very long writing sessions can get a little tiring compared to the all-plastic competition or a fountain pen. When held very close to the tip it feels a little top heavy. Because of the smooth barrel, writers that prefer an ergonomically shaped grip section or some rubber might feel their fingers slipping down towards the tip a little, but that is no issue when you realize how little pressure the G2 refills require. This pen is very well suited for the task that I bought it for. Taking it out of your inside pocket, jotting down some quick notes in a pocket notebook. The build quality and material gives you the confidence that this pen will perform every time you rely on it. The Retrakt follows up a very different pen that I received before it and that I fell instantly in love with: The Retro 51 Tornado. Unlike the Tornado, the Retrakt did not come in a fancy tube, ready for display. The refill does not deploy by twisting the top, which feels like it is suspended in cream. No, the Retrakt feels more like the performance auto-parts that KarasKustoms is also selling. You get to feel metal sliding over metal every time you push the knock. You consider keeping the parts lubricated, to ensure optimal performance. You don’t get a refill with it, you go and get one yourself that you like and that works for you. If it doesn’t fit, you spend a little time and effort to make it work. Once I realized that I it all fell into place and I am now absolutely amazed by my Retrakt. I carry it inside my jeans pocket, clipped to the side, and I catch myself touching and playing with it while I walk down the street. When you look up other reviews of the Retrakt they are full of praise for the design and the craftsmanship on display here. For whatever reason, it took me some time to appreciate that. You should be aware that this is not a mass produced uniform product, but an artifact of craftsmanship. 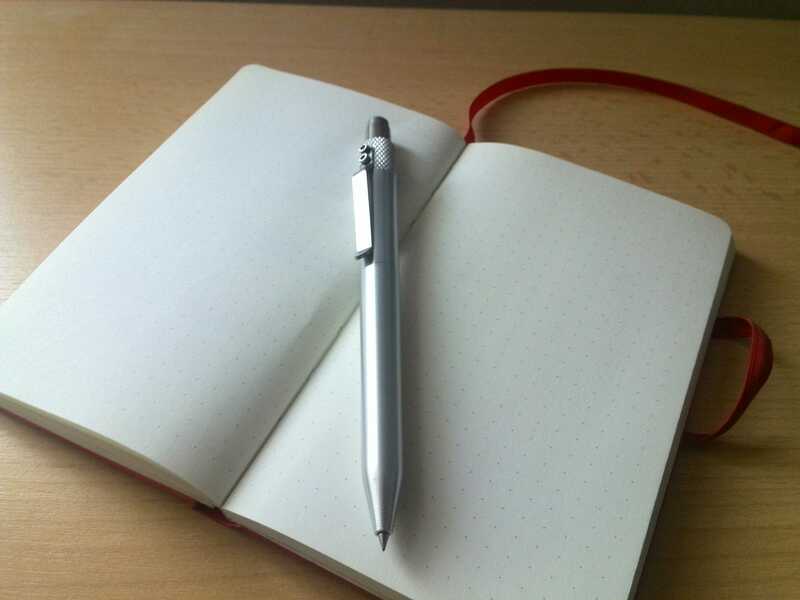 You need to invest some time and thought into it, and you will get it all back and so much more from the performance and overall feel that this pen exudes. Maybe I lack experience with machined pens, maybe I was coming from something too different with the Tornado, but once I got it… Oh boy. Great pen.